For the past couple years, RNAS Yeovilton Air Day has been blighted by poor weather conditions. The flying display for the 2009 event, celebrating Fly Navy 100, was badly hit by low cloud, prevent much of the programmed fast jet displays. After being hit so badly for such a significant celebration of naval aviation, would the weather gods smile on the Somerset air base for its 70th Anniversary show? Philip Jones went to find out. Photography by the author, Ian Matthews and Paul Fiddian. On entering the show through one of the three gates, and after a short waiting time compared to past shows, we were in and with a couple hours until the flying started at 11am, this was a good chance to walk around the static display. It was evident that the numbers of aircraft were down on previous years, and this may have been a source of disappointment for some. The larger aircraft that had cancelled their attendance left large, hard to fill, spaces of tarmac. However the quality of the aircraft present was excellent as ever and along with most of the current Royal Navy types, there were Dutch F-16s, French Navy Rafale and Falcon 10, and a German Air Force Phantom and Navy Lynx. Historic Royal Navy aircraft also made welcome appearances including a selection of cockpits, Sea Vixen XJ481 of the Fleet Air Arm Reserve Collection and resplendent Wessex XT765. 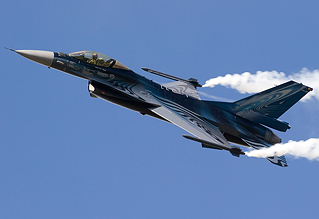 The flying display "proper" started with a bang with the Belgium Air Component F-16AM, flown by Michel 'Mitch' Beulen. The overcast skies during the early part of the display didn't help show off the new "vortex" livery, however, this was just the spectacular opening the show needed. In a RIAT 2009-esque trio of solo displays of the same type, Mitch was joined later in the day by Captain Tobias "Hitec" Schutte of the Royal Netherlands Air Force and Captain Peter Vejling Kristiansen of the Royal Danish Air Force. Far from being repetitive, this was a good chance to compare the ways in which the three nations display their aircraft. Each using flares to add extra punch, these displays were a spectacular way to show the crowd what front-line fast jets can do. After the roaring opener, the next couple displays from the RAF Tucano and RN Jetstream pair were a lot more sedate but no less well flown. It was a pity not to see the special Battle of Britain liveried Tucano flying the display but they were apparently on duty elsewhere during the weekend. From the Jetstreams, this was probably the last airshow outing for them as they are earmarked for retirement in 2011. French participation in the flying came in the form of the Alpha Jet trainer and one can't help but compare this to its British counterpart, the Hawk T.1, although this wasn't present at the air day. On the perennial point of controversy, the author holds the opinion that the Alpha Jet appears to give a more sporty routine with a quick climb and roll after takeoff. The whole routine is peppered with 'cheeky' aileron rolls and generally seems more dynamic, and although distant at times, it still seems to stay closer to the field than the Hawk. The naval historic element of the flying display was kicked off by the RNHF Sea Hawk and Kennet Aviation Seafire which performed a loose pairs display before splitting into the individual solo displays. It was a shame that despite the hard work of the historic flight, Swordfish LS326 remains grounded. Replacing the sadly unserviceable Sea Hurricane, Peter Teichman stepped in to display his Hurricane IIb which also flew a few passes with the Seafire. 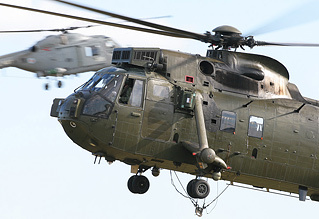 The helicopter solo display duties were most capably carried out by the Royal Navy Merlin HM.1 from RNAS Culdrose, showing the manoeuvrability of the large helicopter. The Reds Arrows were the first of two national display teams to appear at Yeovilton, the second being Spain's Patrulla Aguila. In the improving light, the Reds' 9 Hawks put on their ever polished, ever spectacular display, setting the bar at its highest. In the lead up to the airshow weekend, it had been rumoured that the Red Arrows and Vulcan would perform a flypast together. Indeed, when the Red Arrows taxied past XH558 whilst she was starting up, it looked likely. The launch and recovery of the Red Arrows came and went, with the Vulcan still waiting on the ground and so the bonus of a combined flypast didn't come to fruition. 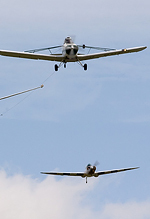 However, Martin Withers gave the crowd the fantastic display they had been waiting for since the poor weather and aircraft serviceability snatched the chance away last year. 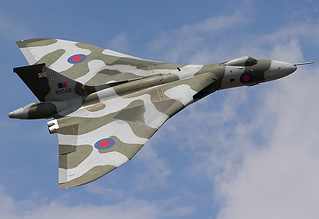 The Vulcan "howl" and the chance to see the aircraft up-close when she was taxied right up to the crowd post-display will undoubtedly stick in the minds of many a show go-er. 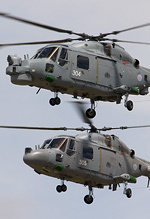 The home team's Lynx featured quite heavily in the afternoon flying programme. The Black Cats' pairs routine as tight as ever, and this year a formation of four of the type performed a "Marine Demonstration", showing off their capabilities and culminating in a large flare release to rival any European F-16 display. "I have been involved with RNAS Yeovilton Air Day since 2005 and I honestly believe this year's event was the best yet: a worthy tribute to the base's 70th anniversary. The flying display was comprehensive and featured excellent and extensive foreign military participation, while several key historic aircraft flew the flag for the FAA alongside their modern counterparts. 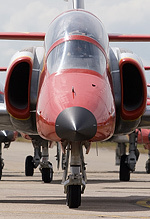 With a range of exciting ground displays, some excellent weather and positive post-show comments from members of the public to boot, Air Day 2010 can be considered nothing other than a great success. Roll on Air Day 2011!" Popular civilian acts The Breitling Wing Walkers, The Swift Aerobatic Team including Guy Westlakes awesome Glider routine, and the new Twister Duo also appeared during the varied flying programme. Now to the welcome return of the Harrier to the flying display. The Air Day has enjoyed flying participation from Harriers for its own Commando Assault demonstration, during the solo display hiatus. However spectacular fast passes and pyrotechnics are though, the hovering and bowing of the solo display was fantastic to see again, reminding the crowds of Yeovilton's former residents. Hard to believe it has already been 4 years since the retirement of the "Shar". The second national formation display team was the Spanish Patrulla Aguila, with their 7 Casa Aviojets. This is always a well flown, precise display but the inevitable comparison with the Red Arrows might not do them any favours. The famous formation landing was unfortunately not a part of the display, but this may have been due to the brisk crosswind. The last historic type, Yeovilton's past was the Venom of Air Atlantique. This graceful display of the diminutive twin boomer carried on in the same vein as the Sea Hawk earlier in the day and substituted for the Sea Venom, an aircraft that is now sadly only available as a static example. The Air Day's set piece which traditionally closes the show is the Commando Assault demonstration. Now the RAF Role Demo has come and gone, it is fantastic that we still get to see this spectacular display of men and equipment, rotary wing and fast jet aircraft. Perhaps a little cut down this year, as there was no RN Merlin, ASAC Sea King or RAF helicopters participating, this was none the less a swashbuckling way to bring the curtain down on this year's event. Nothing quite says "Fly Navy" like the final "bow" of all the helicopters hovering in front of the crowd, whilst the Hawks and Harriers shoot over the top and the remaining pyrotechnics are let off in one huge explosion. To conclude then, Yeovilton's Air Day, celebrating it's 70th anniversary was treated to some good weather which thankfully allowed the full flying programme to go ahead. Although the static was lower in numbers, the 6 hour flying display more than made up for it. Including a wide variety of aircraft, some which represented the base's rich aviation history, the show was overall a great success. Next year the show will be held on July 9th - be sure to mark your airshow calendars! "It was my first ever visit to the Yeovilton Air Day. I sat down the Eastern end to the right of the grandstand and have to say I thouroughly enjoyed the day. The weather was great once the clouds finally broke around 12:30pm and I thought the flying display was brilliant with a good mix of fast jets, classic types etc." "I enjoy the static just as much as I do the flying and it was awful. Lots of light aircraft and not even interesting ones at that. No RN Merlin, plenty of Sea Kings in the hangars, more needed outside. Not having at least one large aircraft really showed. Seems crazy that nothing from the AAC or Boscombe could be persueded to come a few miles away. Sadly I can not see things improving in the near future as regards participation." "As far as the static display was concerned: Phantom was great, Rafale a very nice addition as was the camo Hornet Moth. You don't see many of them around! It was a good idea towing a couple aircraft over from the museum but Yeovilton really ought to concentrate on its roots - it is a Naval air station and the airshow should reflect that. They're not far off but a little push in the right direction would make all the difference."